How much building fire safety is enough? A fire causes by a explosion has killed 1 person and injured another 17 in Premia de Mar (Spain). This fire has left some stunning pictures. 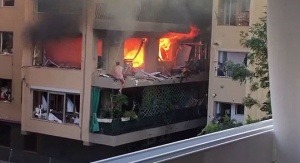 In one of them, we can see how a neighbor is trapped on the edge of the balcony, naked and trying to escape from the flames. Finally, the man has been rescued by firefighters. It is a seven-storey building and the explosion, which took place on the second floor, has shattered the lower floors and caused an extensive damage to the adjacent buildings. The incident has surprised most of the neighbors, who were sleeping. According to another of the neighbors, “it was like in those scenes you see in action movies. When we tried to leave home, we were in trouble because we could not open the door…” recalls the man. From mercortecresa we wonder how much building fire safety is enough There are many fires occurring every week in different buildings throughout the world. In new buildings, passive protection solutions should be considered when doing the budget in order to avoid a greater damage in the future. In old building, you can install some elements to help to the fire detection, evacuation systems, control or alarm systems when it is detected.